We hope that everyone had a safe and enjoyable 4th of July celebration. 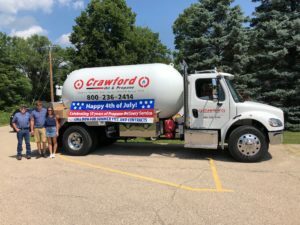 A special thanks to Steve Krueger, Steve Krueger II, and Emma Carpenter for helping in the Pardeeville Parade yesterday. The day was hot, but we had a great time handing out candy and koozies! The markets are choppy due to a short week of trading. I will update more next week. Please call now for your summer fill on propane and sign up for your 2018-2019 heating contract. Information is available and being mailed out this week.